With an overwhelming competitive wage market, guard service firms are not just faced with competitive turnover – losing to another peer – but also turnover to other industries. 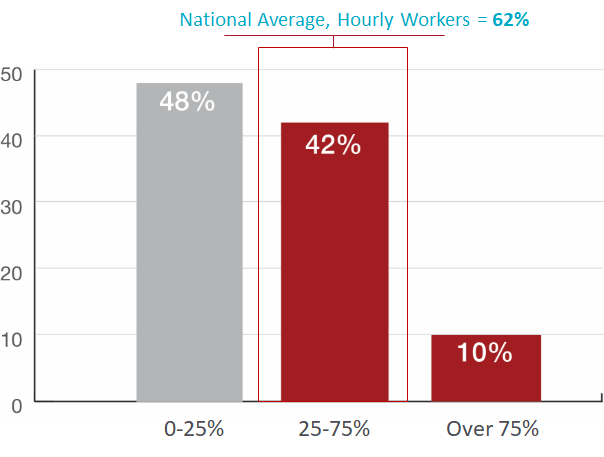 Favorable wage rates and a historically low unemployment rate contribute to resources leaving the industry altogether to seek better pay rates. This is a major challenge to try and offer a competitive rate for a job that demands more of its employees for security and safety of a client. One of the biggest challenges facing turnover in security isn’t even in the security guard industry. Retail is one of the largest competitive threats to the guarding industry today – the wage rates from big box stores can impact the ability to retain talent, and security firms are forced to maintain competitive wage rates to retain business. Ultimately, this cuts into their margins, which can force a company to seek efficiencies in operations. 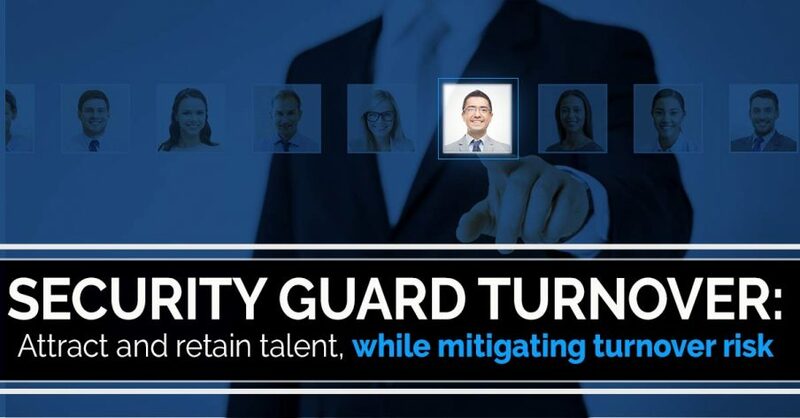 While still aligned to the national average, the reality is that in the security guard space, over 50% of the industry is seeing a turnover rate that is equal to or higher than the national average. This simply shows that this level of turnover is not indicative of a larger national shift, but that security firms are seeing higher turnover rates than the average. Figure B: Illustrates the various methods security guard firms use to attract new talent. Nearly half (45%) are using digital outreach, while referrals still factor into the equation. What’s interesting is the wide range of options that are employed by security guard firms. This indicates that there is no “magic bullet” in terms of recruiting talent. Companies are trying various different ways to build their applicant pool. 45% of firms in the report are using some sort of digital outreach, whether through job boards or Craigslist, while another 27% are leveraging more traditional HR teams and recruiters to seek out applicants. Perhaps the most interesting factor is the 26% that stated referrals still are a major source of their recruitment methods. This is particularly of note in that referrals are a lower cost source of recruitment and often can help to alleviate the burden of building a talent pool through paid methods. Whether this is employee referral or client referral, it still stands to reason that security firms still have the ability to attract talent through this method. Figure C: Cost to Hire Rates, compared to the actual hidden elements most guard firms do not consider. As you can see, the figures are fairly split evenly, ranging from under $100 to over $300 per month per employee to attract, hire and onboard new talent. This isn’t completely surprising, considering that there is a need to keep hiring costs low. This rate is well below the national average, but for a low-margin business, it’s important to be as lean as possible when looking to increase resources. Let’s just run an example against the data to see the impact. If we know that the majority of guard firms are seeing 25-75% turnover (let’s take an average of 50%) and it costs an average of $100 per employee per month to hire and onboard, what is the impact? Figure D: The Cost To Hire metric needs to factor in turnover rate to determine your true cost. This means that for every $1 we spend on an employee, we lose $1 on a lost employee due to turnover. So, the cost to hire an employee is effectively DOUBLE what we think it is, just because we expect to lose half of them. So, with a turnover factor applied, a $100/employee/month expense is, in reality, a $200/employee/month expense with turnover factored into it. One of the elements to turnover is not just a pay rate element, but the human element. Providing a working environment that promotes interest and desire to work helps immensely to retention. 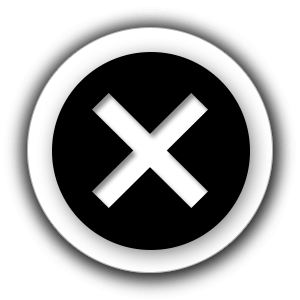 A constant parade of different guards to a customer can cause service problems and significant unease that may trigger the cancellation of, or failure to renew, the contract. But more importantly, the “domino effect” of turnover among the workforce is low morale, which creates unintended consequences. Simply put, morale affects performance. To mitigate these risks, it is important to invest not only in the activities leading up to the hire, but post-hire as well. Recognition, benefits, continual training and competitive pay help to stave off the impact of turnover and ensure that the efforts invested in hiring the workforce are also leveraged to retain them against competitive threats from within the industry and from outside markets.